Do a quick search on this site and you’ll find five other reports on Huet wines that I’ve enjoyed over the past several years, as well as an accounting of our trip there in June 2014. One of my favourite Loire Valley wineries, Huet is famous for it’s adherence to the biodynamic method and the benchmark quality of its Chenin Blanc wines – even since The Takeover (although some will argue against that). These are the Chenin Blanc wines other producers aspire to make. I brought this wine out to share with several foodie and wine friends when we vacationed together recently. On the eyes, it’s pale gold with those gorgeously classic aromas of sweet apple, wet hay, honey and barnyard. After it warms a little, the anise hits. The palate is dry with medium plus acidity and flavours of honeyed, red apple, significant green leaf, and hay, hay, hay with wet wool – wet wool as in, there are literally sheep hanging around in the rain just outside the door. Seriously. The finish lingers. WSET Very Good plus – this wine is complex, layered, balanced and evolved over the course of the evening. Truthfully, I opened it early; it could last until 2020. It went perfectly with Castellano and goat cheese with red pepper jelly and slices of apple. 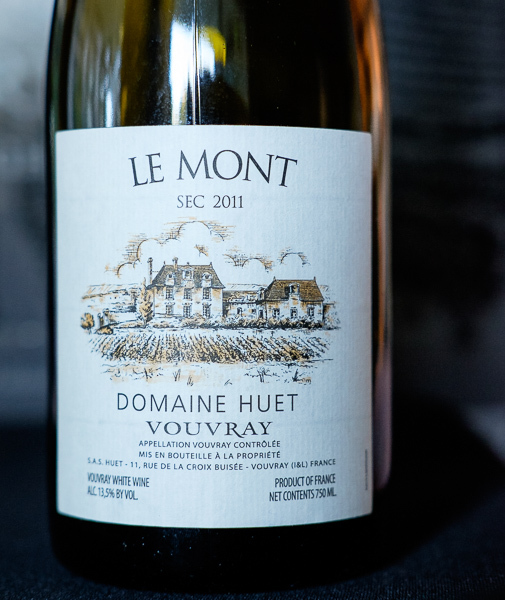 This entry was posted in Chenin Blanc, France, Loire, WHITE and tagged biodynamic, chenin blanc, domaine huet, france, Le Mont, loire valley, sec, Vouvray AC, white wine, wine. Bookmark the permalink.